Official synopsis: "The monster showed up just after midnight. As they do. But it isn’t the monster Conor's been expecting. He's been expecting the one from his nightmare, the one he's had nearly every night since his mother started her treatments, the one with the darkness and the wind and the screaming... The monster in his back garden, though, this monster is something different. Something ancient, something wild. And it wants the most dangerous thing of all from Conor. It wants the truth. Costa Award winner Patrick Ness spins a tale from the final idea of much-loved Carnegie Medal winner Siobhan Dowd, whose premature death from cancer prevented her from writing it herself. Darkly mischievous and painfully funny, A Monster Calls is an extraordinarily moving novel of coming to terms with loss from two of our finest writers for young adults." I really enjoyed Siobhan Dowd's work, in particular The London Eye Mystery (which I have a signed copy of somewhere in my bedroom!) 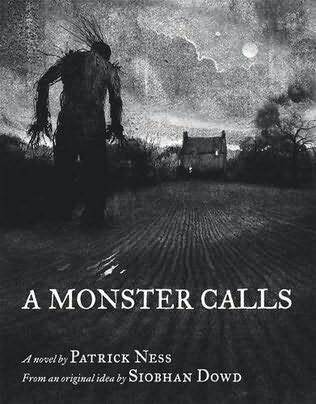 and was saddened when she passed away shortly after its publication, so when I heard that The Monsters of Men author, Patrick Ness was going to be taking the helm of her final idea in the form of A Monster Calls I was somewhat excited and apprehensive in equal measure. Could her work be done justice? Would Patrick do the job as Siobhan could and do it justice? In short, I need'nt of worried one little bit! A Monster Calls is perhaps the most hard-hitting, touching and beautiful books I have read ever, let alone this year. In essence it's the tale of Conor trying to come to terms with the fact his mother might not recover from her ongoing struggle with cancer, something he just doesn't want to face at the same time as suffering crippling nightmares. Having had several relatives die because of the disease I found myself back in the mindset I was in all those years ago when it was going on. I suppose that's one the reasons the book hit me so hard. Nearly everyone knows someone or is related to someone who has either fought cancer, or lost their lives to it. So many of us can relate to it. A Monster Calls is also about truth. It is something of a monster. We all have hidden truths that haunt us. Be that the fact that a relative is dying, or something as mundane as the face that our previously white boxers where dyed pink when something red was put in the wash. Regardless of what it is, there are truths that we just don't want to, or refuse to acknowledge. Written with such care and in such a beautiful manner, this book is one that I for one am going to treasure for years to come. I can't stress enough what a brilliant reading experience it was. Coupled with the stunning illustrations by Jim Kay, it's a treat on the eyes in a visual sense as well as in a reading sense. I love the way that certain parts are broken up by the artwork. A floor covered in pine needles. A graveyard. It left me with a weird sensation in my chest when I finished it. I can't quite put my finger on it. It felt like when you get a lump in your throat and you find it hard to breath, you know?! Like on the verge of crying but for different reasons all at the same time. Sadness, relief even. The ending as well... well I can't say anything but that is all I need to say on that front. Enough said. I cannot recommend this book enough, praise and thank Patrick enough for creating something so brilliant, so beautiful, and for want of a better word... AMAZING! To Walker for actually making this available to the world, and for sending me a review copy! And of course to Siobhan for having the idea in the first place.